Home » Category archives "Italian"
Have you guys had tortilla pizzas? I’d heard about them, but hadn’t tried it until last week. A flour tortilla acts as the crust (a particularly sturdy one, mind you! 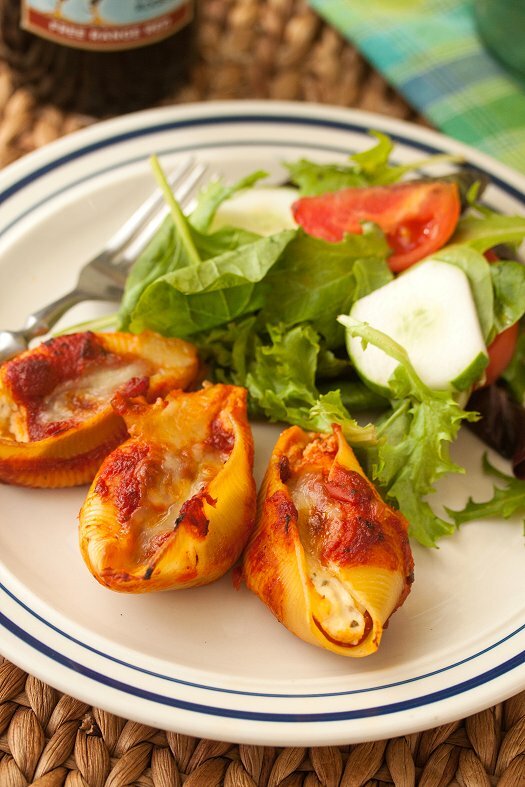 ), topped and cooked in a cast-iron skillet for just a few minutes. A complete no-brainer, with ingredients that you probably already have hanging out in the pantry already! Which, I so need meals like this in my life right now. Boy scouts, soccer practices and games, homework… and, now the Holidays right around the corner? Sheer craziness. The best part is, it can be switched up so easily! 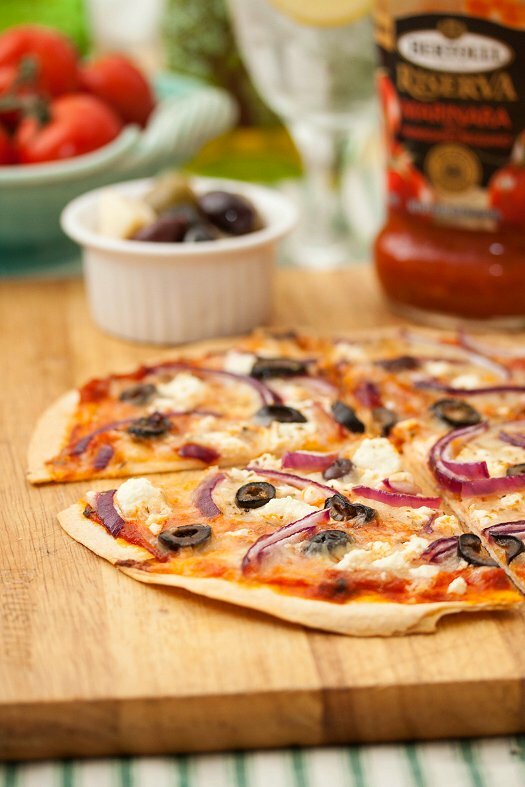 Whether it’s a trip to the Mediterranean coast with salty olives and feta cheese like this example, or barbecue sauce and chicken, or topped with a ton of veggies, or the more traditional route with just cheese and pepperoni – the possibilities are endless. Bertolli recently reached out to me about participating in their My Tuscan Table campaign to celebrate their 150th anniversary. 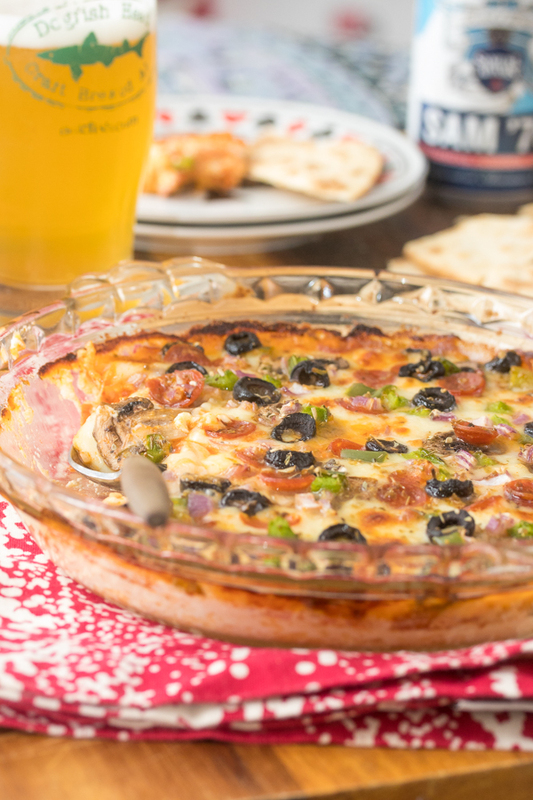 I wanted to do something very traditional and Italian…but the truth of the matter is, a quick dinner consisting of something super easy like tortilla pizzas and a simple green salad are the norm for our family’s table these days. Everyone gathers around to make their own, which is really important on those busy nights. Cooking and enjoying a meal together is pretty much the cornerstone of Tuscan culture, in fact, I’m pretty sure it transcends all cultures! Bertolli’s new Riserva line of sauces make it super easy – and with fresh ingredients and no additional sugars, it they bring new hope to the jarred pasta sauce aisle. I’m usually a homemade girl, but sometimes you just need a good store-bought sauce! Bertolli is asking everyone to share their Tuscan tables. For every hashtag “#MyTuscanTable” used during the month of October, they’ll be donating $1 to Share Our Strength’s No Kid Hungry campaign. So get to hashtagging, folks! Brush one side of the tortilla lightly with olive oil. Place the oiled side of the tortilla down in a 12-inch cast iron skillet. Spread sauce evenly across the tortilla, leaving 1/2-inch around the edges. Sprinkle with cheese and toppings. Bake until the cheese is melted and bubbling (no sooner!) and the edges of the tortilla are lightly browned, about 10 minutes. Let the pizza cool for a few minutes before slicing. Disclaimer: This post is sponsored by the good folks at Bertolli. As always, all thoughts and opinions are my own. Things have been crazy around here. Pony Penning took place last week here on Chincoteague, second only to Christmas around these parts. Friends and family are in town, we were busy running around to one event or another, and good home-cooked meals (and blogging) kind of fell by the wayside. Crab season is also in full swing here on the Eastern Shore. They’re cheap, plentiful, and heavy. I paid $50 for a bushel of #1’s the other day – that’s insanity! I’m very fortunate to be able to cut out the middle men, and go directly to the source. 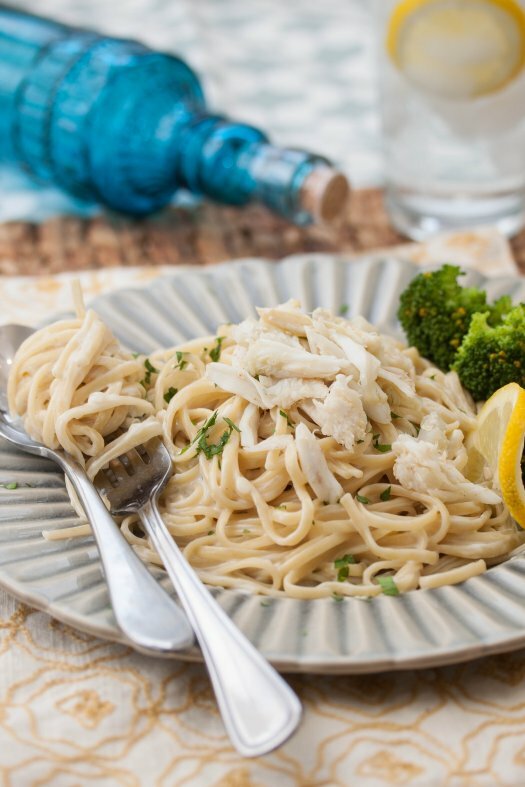 On those nights when things are crazy, and you want something easy and delicious that doesn’t take forever – this crab alfredo always answers the call. Five minutes to make the creamy sauce while the pasta is cooking, a quick warm-up in the pan for some fresh crab meat… and you have an ahhhmazing pasta dish that took no time to prepare, but is impressive as all get out! A side of steamed broccoli or a green salad, and a glass of white wine paired alongside makes for a perfect light summer meal. Cook pasta according to package directions. Drain, and place back in the pot. While pasta is cooking, prepare the sauce. Melt 8 Tbsp (1 stick) butter in a large saucepan over medium-high heat. Slowly whisk in the heavy cream. Cook, over medium heat until simmering. Combine the cornstarch and cold water, whisk into the cream mixture. Cook, whisking constantly, until sauce thickens. Take off heat, and whisk in the Parmesan cheese. Season to taste with salt and white pepper. Keep warm while you prepare the crab. Melt remaining 2 Tbsp butter in a skillet over medium-high heat. Add the garlic and cook until fragrant, about 30 seconds. Add the crabmeat and carefully toss to coat in the garlic butter. Let sit for about two minutes, until just warmed through. Add 3/4 of the Alfredo sauce to the pasta, and toss to coat. Plate portions of the pasta on a plate, and top with a generous portion of the crabmeat. Serve with a wedge of lemon and fresh parsley for garnish, if desired. Serve immediately.